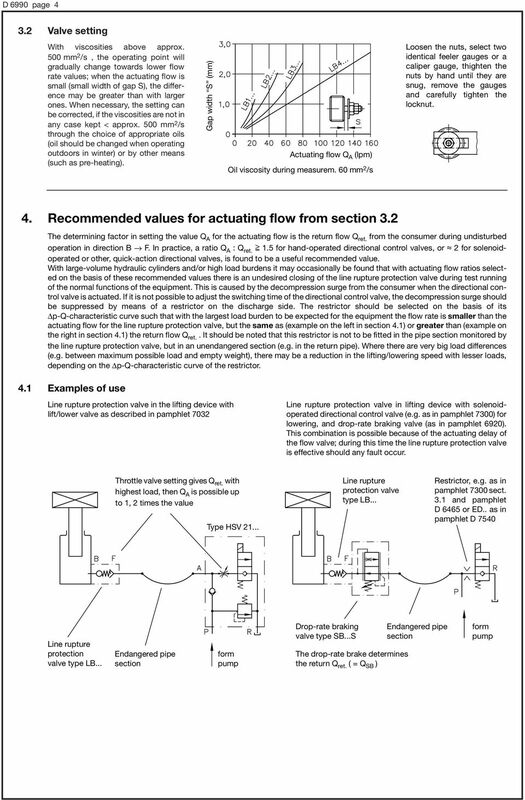 Download "Line rupture protection valves type LB"
2 D 6990 page 2 2. 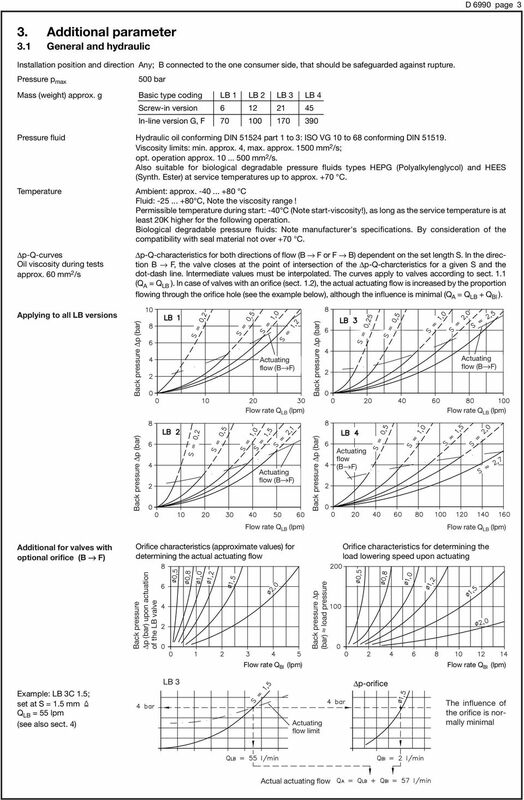 Available versions, main data Order examples: LB 2 C - 40 LB 3 F LB 3 C 1.0 7/8-14 UNF - 50 Table 3: Optional orifice Coding for orifice diameter (& #) only available for valves acc. 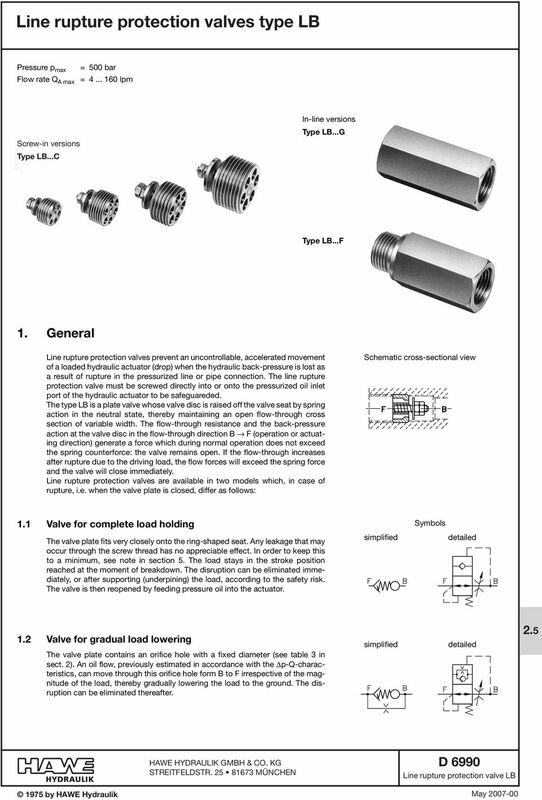 to section 1.2 Suited for 0,5 0,8 1,0 1,2 1,5 2 LB 1 LB 2 LB 3 LB 4 ' ' ' ' Table 2: Design version Design version Coding and illustration Screw-in version C Standard F G In-line version With tapped reducer Screw-in valve size 1 to 3 installed via a tapped reducer (table 1) in the next higher dimension housing (G or F) size 2 to 4. Application example: Adaptation to the port size of other hydraulic devices being utilized e.g. 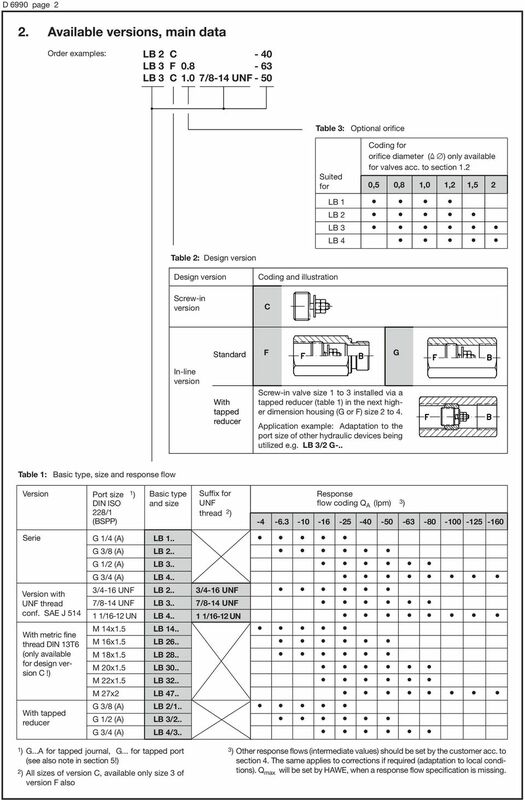 LB 3/2 G-.. Table 1: Basic type, size and response flow Version Port size 1 ) DIN ISO 228/1 (BSPP) Basic type and size Suffix for UNF thread 2 ) Response flow coding Q A (lpm) 3) Serie Version with UNF thread conf. SAE J 514 With metric fine thread DIN 13T6 (only available for design version C!) With tapped reducer G 1/4 (A) G 3/8 (A) G 1/2 (A) G 3/4 (A) 3/4-16 UNF 7/8-14 UNF 1 1/16-12 UN M 14x1.5 M 16x1.5 M 18x1.5 M 20x1.5 M 22x1.5 M 27x2 G 3/8 (A) G 1/2 (A) G 3/4 (A) LB 1.. LB 14.. LB 26.. LB 28.. LB 30.. LB 32.. LB 47.. LB 2/1.. LB 3/2.. LB 4/3.. 3/4-16 UNF 7/8-14 UNF 1 1/16-12 UN ' ' ' ' ' ' 1) G...A for tapped journal, G... for tapped port (see also note in section 5!) 2) All sizes of version C, available only size 3 of version F also 3) Other response flows (intermediate values) should be set by the customer acc. to section 4. The same applies to corrections if required (adaptation to local conditions). Q max will be set by HAWE, when a response flow specification is missing. 5 D 6990 page 5 5. Dimensions of units All dimensions are in mm, subject to change without notice! 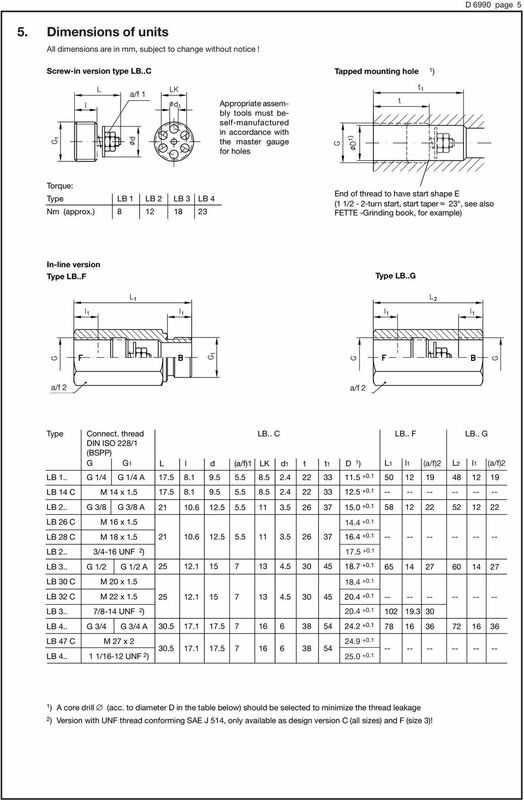 Screw-in version type LB..C Tapped mounting hole 1) a/f 1 Appropriate assembly tools must beself-manufactured in accordance with the master gauge for holes Torque: Type LB 1 LB 2 LB 3 LB 4 Nm (approx.) End of thread to have start shape E (1 1/2-2-turn start, start taper, 23, see also FETTE -Grinding book, for example) In-line version Type LB..F Type LB..G a/f 2 a/f 2 Type LB 1.. LB 14 C LB 26 C LB 28 C LB 30 C LB 32 C LB 47 C Connect. thread DIN ISO 228/1 (BSPP) G G1 G 1/4 G 1/4 A M 14 x 1.5 G 3/8 G 3/8 A M 16 x 1.5 M 18 x 1.5 3/4-16 UNF 2 ) G 1/2 G 1/2 A M 20 x 1.5 M 22 x 1.5 7/8-14 UNF 2 ) G 3/4 G 3/4 A M 27 x 2 1 1/16-12 UNF 2 ) LB.. C LB.. F LB.. G L l d (a/f)1 LK d1 t t1 D 1 ) L1 l1 (a/f)2 SW2 L2 l1 (a/f)2 SW ) A core drill # (acc. to diameter D in the table below) should be selected to minimize the thread leakage 2) Version with UNF thread conforming SAE J 514, only available as design version C (all sizes) and F (size 3)! Piston Accumulators. SK Series. Accumulator Catalog. Piston Types. Description. Sealing Systems. End Cap. O-ring. Sealing System. Piston.